In the sprit of five animals, the movements of roosters, horses, and tigers are emphasized. 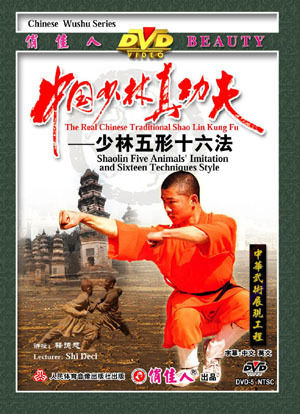 Adopting the fighting techniques of the five animals-the peck of the rooster, the kick of the horse, the crouch of the tiger, the jump of the rabbit, and the twist of the dragon, created this style. Sixteen hand-Skills, step-skills and kick-skills were established basing on them .The change of the techniques is hidden in the coordination of the imitation. The movements are forceful, agile, and practical in combat.